Let me start by saying that I have deep sympathy for anyone asked to be a commencement speaker these days or otherwise tasked with delivering inspiring remarks. After all, this is a perilous time for speakers charged with projecting optimism and articulating a path forward. The fact is that we’re all struggling as we’re buffeted by the nonstop news cycle and unbelievable events — both natural and manmade; events that we never thought we’d see in our lifetimes. So tonight I ask for your indulgence: Allow me to focus narrowly on our work as land conservation practitioners. While I do, please know that I recognize the incredibly challenging social context in which we are operating. I continue to believe deeply that land — and land conservation — can bring people back together to find common ground, thus beginning the healing that this nation needs. Nevertheless, I acknowledge the serious political and institutional problems that we cannot solve through our work alone. But, as I’ll argue tonight, our best response is to face those realities head on with renewed determination and passion for our conservation work. To help me make that case, I want to tell you a story about an experience in nature I had earlier this year. My better half, Alena, and I make a point to raft a new river each year, which typically takes us to the western United States. This is our favorite way to connect with the land and to escape email for at least a few days. This year we rafted the Tuolumne River, a beautiful river in the Sierra Nevada mountains that offers the opportunity to run Class IV+ rapids. One of the biggest rapids is Clavey Falls at the confluence of the Clavey River and the Tuolumne. The rapid is big enough that river guides and their guests must get out of their boats and scout the river to decide how best to run it. Our outfitter, OARS, even goes so far as to include Clavey Falls on its list of “10 of the World’s Most Notorious Whitewater Rapids,” and describes it as follows: a vertical drop of 8 feet, followed by another major drop that makes it difficult to avoid a massive hole. I was thrilled and relieved when we successfully made it through the vertical drops, avoided the hole and bumped up against the rock wall on the opposite side of the river. Our guide encouraged the six of us in the boat to celebrate by hoisting our paddles straight up above our heads. Before we could react, the current had pinned us against a massive boulder in the middle of the river. Our guide tried to fix the situation, but the river ejected him from the raft and washed him downstream. We all climbed to the top side of the raft to keep it from flipping. As we waited for instructions, we stared down into the current roaring around each side of the rock and at the huge hole just below it. Fortunately, our expert guides calmly and systematically performed a series of water rescues where, one-by-one, we grabbed a rope and leapt backwards into the current to be pulled to safety. With no passengers on board, the raft eased itself off the rock and back into the current. Harrowing experiences have a way of focusing the mind and triggering deep reflection, and my experience on the Tuolumne this summer is no exception. One comes away with a greater ability — at least in the immediate term — to live in the present, to be grateful for one’s health and to appreciate what really matters in life. You can also take time to reflect and draw lessons from such experiences to guide you in both your personal life and professional career. To that end, I want to share some lessons that this whitewater experience — and other exciting and sometimes perilous moments in kayaks and rafts — have taught me. I ask you to think about how these lessons can apply directly to our work today as land conservationists. First: Pick your fellow travelers carefully. 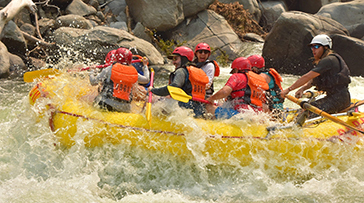 On our Tuolumne trip, all of our fellow passengers were experienced whitewater rafters. Each of us had enough river experience to respect the power of the water, to avoid panic in difficult situations and to understand the value of working together. Looking out at this crowd tonight, I can say that, when it comes to my career in land conservation, I have certainly picked my fellow travelers wisely. In fact, we all have. Look around at your fellow conservationists — talented, passionate, determined and unfazed by the world swirling around us. We have learned the value and art of working together, and every day we demonstrate the power of our community. It continues to be a true honor and privilege to work with all of you to advance land conservation in America. The second lesson: Take time to celebrate, but don’t celebrate prematurely — maintain your focus on what lies ahead and the necessary follow-through. If my fellow rafters and I hadn’t had our paddles hoisted in the air looking into each other’s eyes, we might have noticed the boulder straight ahead. Sure, we survived Clavey Falls, but we lacked the awareness to conquer Clavey Falls. Yes, together we successfully advocated for a Farm Bill that would provide generous resources for land trusts and conservation donors to protect thousands of acres of land. But we must now make sure those provisions stay intact as the legislation exits the congressional conference committee. We must urge Congress to pass the bill this year, and then we must stay engaged in the crucial rulemaking that will follow. Yes, together we successfully convinced hundreds of congressional representatives and senators to co-sponsor legislation that will permanently reauthorize the Land and Water Conservation Fund (LWCF). And bills have now been voted out of key committees in the House and Senate. But now we must do all we can to compel congressional leadership to allow a floor vote in both chambers to reauthorize LWCF this year. And yes, together we have spoken loudly with a unified voice against abusive federal tax shelters involving conservation easement donations. We created a safe harbor from those transactions within the Alliance family of land trusts, and we defeated efforts by a few in Congress to strip the ability of the IRS to crack down on these abuses. But we still have federal legislation to promote and pass. Which offers a perfect segue to the third and final lesson I want to share tonight: Be fearless. Years ago, when I first tried my hand at whitewater kayaking, I learned that one must face challenges head-on while on the river—challenges like boulders and standing waves. I learned you must avoid at all costs having an obstacle snag the side of your boat. That’s when you get flipped, pinned or wrapped. It’s frightening to plunge straight into the trough of a huge wave towering over you, but I learned that is the only way to stay afloat and conquer the rapids. Now I’d like to take credit for articulating that we, as conservationists, need to be fearless in our work. But one of the Alliance’s member land trusts beat me to it. Last year I received a campaign kickoff event invitation from the accredited Columbia Land Trust, which works in Oregon and Washington in area adjoining the lower portion of the Columbia River. The campaign is titled “Fearless Conservation” and features extraordinary artwork. This concept immediately resonated with me at a gut level, and it made even more sense when I read about it. What is remarkable about the Fearless Conservation campaign literature is that it begins with an acknowledgment of incredible threats and daunting odds — threats arising from a rapidly growing population, a changing climate and accelerating habitat loss. And that’s exactly what Glenn, his staff, board and supporters have done. They have articulated a bold agenda for science-based protection and stewardship of the incredible lands in their service territory. And they are raising the resources and creating the political support needed to achieve that mission. Importantly, they are making this happen by engaging in a genuine effort to reach out and listen to people they have not traditionally served or engaged. We as a community need to do all of these things. We need to demonstrate that we are not paralyzed by the environmental, social and political challenges we face. Instead, we need to describe and demand the world we want to see. Even more important, we need to promote what we offer the world, to articulate how we will realize our vision, and demonstrate that we understand that building a bigger, more inclusive conservation community means cultivating a new generation of conservationists. Simply put, that’s the smart and the right thing to do. Smart because we need to make land conservation a salient issue for a multi-faceted, strong and reliable group of supporters who can generate widespread support and abundant resources for land trusts. Right because we have a moral imperative to bring the benefits of conservation to those who have not had the chance to fully experience them. You are making this happen through your local community conservation work, and it’s time for the Alliance to complement those efforts at the national level. This is why the Alliance describes in its new strategic plan our intention to design, launch and lead a nationwide public engagement campaign to elevate the importance of land conservation as a priority in every community. This “relevance campaign” will reach Americans in all places and all walks of life. We’ll go beyond the rural and exurban areas that have been our community’s historic focus and into urban communities as well. Framed explicitly as a “call to action” campaign rather than a public awareness campaign, the ultimate measure of success will be that land and water conservation becomes a priority issue of public concern, with a commensurate investment of public resources. We will work hand in hand with land trusts to design the campaign and make sure that it has flexible messages that you can readily incorporate into your local efforts. And the campaign will be carefully targeted to reach key populations with messages designed to resonate and remain memorable. Speaking of memorable, I want to share with you—as I do every year—the most memorable road sign I came across during the past 12 months as I visited land trusts across the country. So what can we say about this sign? Certainly it’s clever and effective at capturing the attention of the thousands of motorists that drive through Traverse City every day. 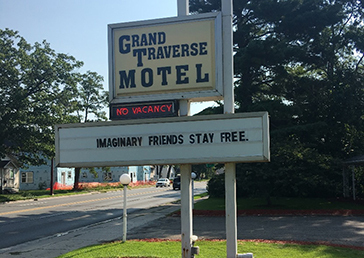 At its core, the sign is all about the hotel’s value proposition but employs humor and a touch of irony. Who knows, maybe we’ll need to take a similar approach in our relevance campaign to attract millennials, generation Y, generation Z and future unlabeled generations to our conservation work. But I don’t think so. We already have what they want in these trying times. We offer the chance to get outside, to see, to touch, to smell and to protect what they perceive to be beautiful and real. And there is every indication that many Americans already understand this value proposition. But the most telling part of the article is a reference to the “2018 North American Camping Report” by Kampgrounds of America. That survey of the general American population revealed that 2.6 million more American households camped last year than in 2016. And campers of African-American, Hispanic and Asian descent now go camping in numbers approaching the percentages reflected in the U.S. Census. The survey also revealed that 93% of millennials surveyed said they would like to try camping this year. Obviously, land trusts offer much more than just camping opportunities, but the point is that the American population is inclined, if not desperate, to experience the outdoors. They are primed to fully encounter and appreciate everything that land, land conservation and land trusts can do for them. We just need to get out there and explain all the ways that conserved land can, in fact, cure much of “what ails them” and otherwise make their lives better. Most importantly, we need to explain how land trusts play a critical role in conserving land. The Alliance is determined to help you do just that. In closing, I want to reiterate that the best reaction to these difficult times is not defeatism or cynicism. The solution to the grief, frustration and anger you feel is not paralysis. The answer is to engage in fearless conservation. And if you think about it, we are all so fortunate to have that outlet for our energies and passions. As I wrote this speech, I typed the words “the antidote to despair is action.” That turns out to paraphrase something Joan Baez once wrote: “Action is the antidote to despair.” She was inspired to write those words in 1983, and they make even more sense today. Stick with me, or, I should say, allow me to stick with you as you continue to take bold action. Let’s honestly and unflinchingly assess today’s problems and challenges. Let’s compare those realities to the world we want to see. Let’s act bravely and inclusively to make our shared vision a reality.